In 1822, the Europeans in Madurai and other Christians of the Anglican persuasion desired to build a bigger church to meet their growing needs. Mrs.Sophia Elizabeth Rash, then a resident of Madurai possessed some land within the fort and was willing to sell it for a small sum if a church was built upon it. Mr. Daniel Burby, a writer in the collector's office purchased as much as would be required for the church for Rs.164/= in October 1824 and made it over to the Tanjore Mission. Then a collection was made in the station and a sum of Rs.153/= was raised. The then Collector, Mr. Rhouse Peter (also known as Peter Pandian) added Rs.1,100/= to this; and a chapel was built in 1827 on the site purchased by Mr.Burby. This new church was owned and managed by the Tanjore Mission of S.P.C.K. 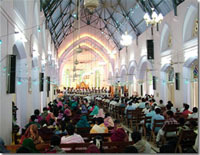 The sale price of the materials of the old church amounted to Rs.470/=. The whole cost was borne by Mr.Robert Fisher and his sister Mrs.Jessie Foulkes, wife of a Madras chaplain. The new church was consecrated on the 15th of June,1881. The church is built of black stones and it is all called "Stone Church". The building measured 50 feet length, 25 feet breadth and a 7 feet wide verandah on both sides. The graves of Mr.Rhouse Peter and George Fredrick Fisher with tomb stones are located in a chamber beneath the Altar. S. S. Colony, Madurai - 625 010.